On August 19, 1939, under dark clouds and stormy conditions, Central Railroad of New Jersey Train 4218, the northbound Blue Comet, departed Atlantic City Union Station on the advertised at 3:35 p.m. with engineer Thomas tugging on the throttle after getting a “highball” signal from Conductor Walsh. Thomas tested the airbrakes as normal safety rules dictate and then the train continued on its northward journey as fireman Cinque fed coal into the large firebox of Pacific 820. 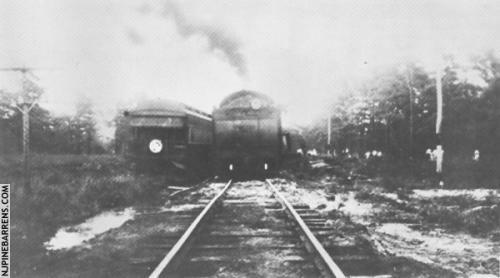 The big locomotive that day towed a five-car train consisting of a combine, a coach, the dining car GIACOBINI, another coach, and the observation car BIELA. The 49 passengers on board for the trip were making themselves comfortable for the journey to Jersey City with the assistance of Train Porter McKonnan. Dining car steward Herring began seating a few folks in the dining car as waiters Adams and Saunders took their food and beverage orders. A quick stop at Hammonton allowed Assistant Track Supervisor Langenbach to climb aboard the locomotive. Passing Winslow Junction at 4:08 pm, the operator hooped up orders to the train crew advising them to keep a sharp lookout for sand overlaying crossings due to heavy rains. The orders also told the engineer and conductor to expect additional orders at Chatsworth. As the train accelerated away from Winslow tower six minutes late, switching from the Pennsylvania-Reading Seashore Lines trackage to the Centrals’s Southern Division, the sun broke through the clouds and engineer Thomas remarked “Perhaps the rain is over.” The train sped through Atsion at about 50 m.p.h. and then Thomas pinched the brakes on as the train crossed several bridges before resuming a speed of 40 to 45 m.p.h. At Carranza, the train entered an intense cloudburst, quickly reducing visibility to a few feet despite a brightly burning headlamp. The engineer immediately slammed the throttle shut and operated the drifting valve as he leaned out the cab window and strained to see the track ahead. His speed dropped down to just about half of the maximum allowable speed of 70 m.p.h. The wayside and cab signals both displayed clear track ahead and the alert engineer found no obstructions at the Pine Crest crossings. Meanwhile, John L. Etheridge, station agent and operator at Chatsworth, heard the approach bell in the station, announcing that the Blue Comet had entered his track block. J.L.’s model board displayed a red pilot light, indicating that a train occupied the block and that the signal controlling his block now displayed red for “stop” behind the train and for any opposing traffic. While waiting for the COMET to arrive, J.L. patiently taught 12-year-old Walter Brower, a local Chatsworth resident, about being a railroader. He prepared to hand up orders to the COMET’s operating crew, but he suddenly became aware that he could not hear the train approaching. About 4:45 pm, at a point 1.15 miles past Pine Crest, the engineer heard a crash while the train was moving forward at a speed of 35-40 m.p.h. Upon hearing the noise, Thomas immediately jerked his head around and looked backwards to see that the locomotive and tender had separated from the remaining portion of the train. He began to feel a vibration in his feet as the rear tender truck wheels bounced along the ties and the engineer brought the locomotive to a halt as quickly as possible, but the lack of operational tender brakes extended the braking distance for the big engine. The locomotive and tender ripped up about 600 feet of track. Water surrounded the track alongside the locomotive, making the trip back to the cars treacherous. As the engine cab’s occupants made their way towards the train, they observed that the five cars had derailed and all sat along the right-of-way at various angles. Passengers screamed as they feared the cars, all sitting at steep angles, would overturn, but none did. As the deluge subsided, other rescuers soon arrived, including Walter Brower, who had run down the track from the Chatsworth Station. He aided the Kirby family, who hailed from Kentucky, to remove their luggage from the stricken train. Inside the cars lay 32 passengers who had sustained injuries, two seriously, along with six hurt crewmen. Most of the carnage occurred in the last two cars. A fire initially broke out in the dining car galley which the staff quickly contained, but not before Joseph L. Coleman, a black chef in the car, suffered burns from the oil stove. The other crew members dragged Coleman from the blazing wreckage before extinguishing the fire. 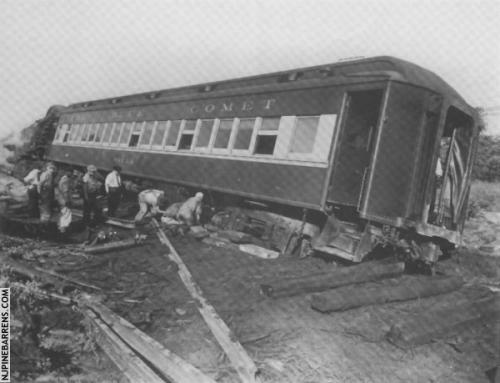 Many of the hurt passengers had been sitting in the observation car BIELA and received cuts and bruises from the unanchored wicker chairs flying through the car. Other trauma occurred in the dining car, where flying plates and other projectiles struck four crewmen. In addition, the flagman and the porter on the train both sustained unspecified injuries. After some delay due to the remote location of the wreck, ambulances arrived from towns throughout South Jersey. Rescue officials used a handcar to transport the litters from the scene to the waiting rescue squad vehicles in Chatsworth. The rain of Biblical proportions had also washed out the only road back to the derailed train. The ambulances rushed three of the injured, including Chef Coleman, to Burlington County Hospital in Mount Holly while three others headed to West Jersey Homeopathic Hospital in Camden. The relief train finally departed from Jersey City about 9:30 p.m. and returned at 1:39 am with the passengers able to continue their trip. Among them was Mrs. Margaret Sciria, age 26, of Brooklyn, New York. She reportedly carried her daughter in her arms for 2½ miles along the railroad tracks, walking the ties and sometimes wading through water up to her hips to reach the relief train. She stated, “The baby looked on it as a lark and laughed the whole time in spite of the rain, but I didn’t feel like laughing as I trudged along.” Neither she nor her baby received any injuries. 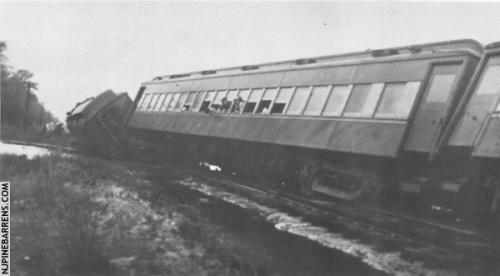 Track engineers and federal inspectors found 20 feet of track and right-of-way completely washed-out, although the rails remained connected until the Blue Comet crossed them. The U.S. Weather Bureau station at Tuckerton recorded rainfall of 14.81 inches, the heaviest rain beginning about 3:00 p.m. With the injured removed from the train and taken to area hospitals, the clean-up effort began. A track gang of 500 men restored the tracks within 48 hours, after initially facing a delay from the bursting of the Union Lake dam, which flooded a drainage ditch and washed out about 30 feet of trestling just to the north of the wreck. The workmen laid down several tons of rock before the wreck trains from Jersey City and Elizabethport could reach the scene. No sooner had crew repaired the Union Lake flood damage, then a crane traveling down the railroad with its boom up pulled down all of the power, telephone, and telegraph wires crossing the tracks at Main Street, Chatsworth, disrupting electric service and communications for most of the day on August 20. Railroad inspectors found the dining car GIACOBINI damaged beyond repair and the car body spent the remainder of its days off the rails serving as a freight station near Communipaw Avenue in Jersey City. The Central put the remaining cars back into service, but the Blue Comet only continued operating for another two years. 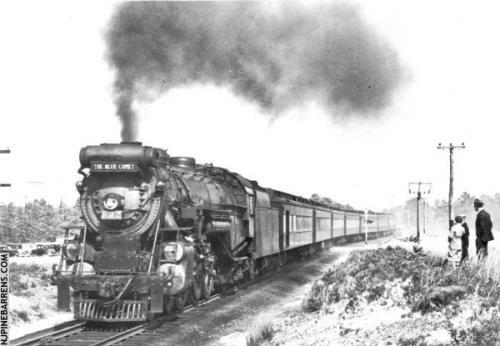 The fabled train made its final run on September 27, 1941, and then passed into the annals of Pineland legends.